The idea of the bandsaw dates back to at least 1809, when William Newberry received a British patent for the idea, but bandsaws remained impractical because of the blades. No-one could make a bandsaw blade that could withstand the constant flexing until Frenchman A. Perin introduced a viable blade in the early 1860s. Bandsaws quickly became popular in England and the rest of Europe. By the late 1860s the blades had made their way to North America and the first manufactured American bandsaws appeared. Before that, though, there were a surprising number of patents as inventors either anticipated the eventual development of better blades, or were so impractical as not to notice that blades were not available. Check out some of these patents and then make up your own mind. 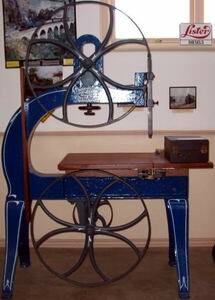 The first American bandsaw patent was granted to Adam Stewart of Baltimore, in July of 1817. 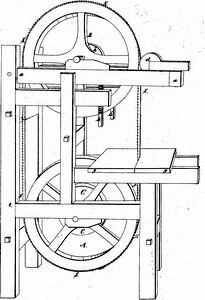 Stewart's patent was lost in the 1836 patent office fire, and so far we have only the patent title ("Band or belt saw") plus a description written by a magazine editor who confessed himself as "little acquainted with machinery in general". He describes a conventional two-wheel vertical band sawmill; no mention is made of blade guides or how the blade is tensioned over the wheels. An example was built by R. French, a millwright from Morrisville, PA. Stewart offered to license his patent and French offered to build the Stewart patent sawmill to order. There is nothing to suggest that their saw ever achieved any long-term success. 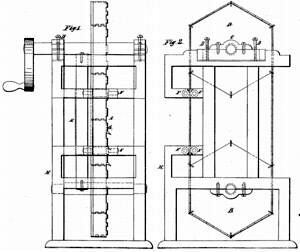 The next American bandsaw patent was granted to Benjamin Barker of Ellsworth, Maine, in January of 1836. 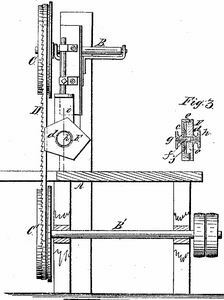 Barker patented the basic concept of the bandsaw. There was obvious prior art, but before July 1836 there was no review process for patent applications. 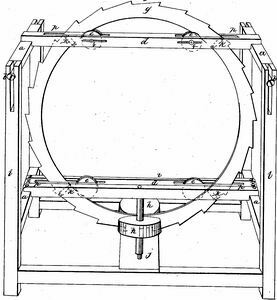 Barker's machine used a blade 34 feet long, 9 inches wide, and one twelfth of an inch thick, or about the thickness of a thin-kerf circular saw blade. The wheel's diameter was five feet. Notice how the frame of the saw is not a C-frame but more of an I-frame. That reduces the saw's horizontal capacity by half, but with five-foot wheels it hardly matters. The very large wheels reduced the degree of flex experienced by the blade. A good idea but still a dead end. The next bandsaw patent came along only a month later, granted to one William Cary of Poughkeepsie. We are not sure what Cary was thinking with this bandsaw design, but it looks wildly impractical. After those two 1836 patents, the next true bandsaw patent came in 1849, granted to rule maker and sawmill maker Lemuel Hedge. This design looks pretty normal. The saw has upper guides, albeit odd-looking. 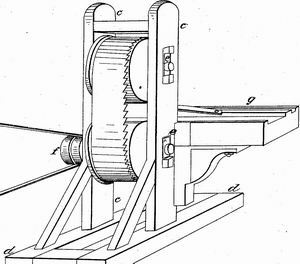 In 1857 Hedge's patent was reissued. Hedge was deceased by that time, and the reissued patent was assigned to William P. Wood and Samuel De Vaughan of Washington DC. We don't know anything about these guys other than the patents they were granted, but it is at least possible they manufactured the saw, otherwise why would they go to the expense of a reissue? Further research is warranted. 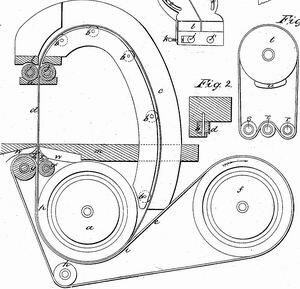 In 1851 Hedge received another bandsaw patent, this time for a radically different design. There are two odd things about this saw. First is the use of several small wheels instead of a single upper wheel. Second is the driving mechanism: a secondary belt wraps around the bottom of the lower wheel and drives the blade. The intent is to only tension the straight part of the blade that is in the cut; the rest of the blade is untensioned. Interesting, but a genetic dead end. The "band" is made of a series of inflexible links with hinged joints. I don't understand how this saw could work. As the hexagonal wheels rotate, the blade is going to move back and forth laterally. There are upper and lower blade-guides but the geometry just does not work out. Pryibil's patent covered an upper blade guide design that looks rather impractical because it consumes too much vertical capacity. 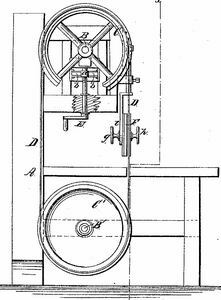 More importantly, the patent covered the use of a spring to make a yielding mount for the upper wheel. 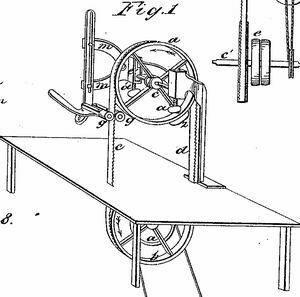 The patent's importance in itself is modest; we skipped over some more important bandsaw patents because of insufficient entertainment value. But Pryibil's patent is notable because it is, so far as we know, the first patented bandsaw that actually saw commercial production. Although the saw above does not exactly match the patent drawing, it uses the patented upper-wheel mount and carries the 1866 patent date. One of the best, simplest and commonest tools is the band saw, and for some singular reason this is hardly ever used in America. It consists merely of an endless saw passing over two pulleys, one above the other, by which it is kept in tension and driven. One pulley is made adjustable so as to regulate the amount of tension, and is furnished either with a spring or a counterweight to allow of the expansion and contraction that necessarily occur from the heating and cooling of the saw when in use, without either causing the band to become loose and slip, or to snap from over-tension. 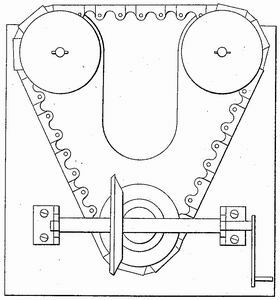 The advantages of this tool are most obvious: as the motion is always in the cutting direction no time is lost in reciprocations, and for the same reason much more delicate work can be done with it, as there is no alteration of strain which would tend to break thin portions of wood, and, moreover, a fan is rendered unnecessary, as all the saw dust is carried down beneath the table. The pulleys generally have leather coating for the saw band to run on, though this is not always the case. The English are certainly ahead of us on this tool, for if, as I have heard it said, we have not been able to make it go, they have, and there is no shop of any consequence without it. With the first known ad and commercially manufactured bandsaw, the prehistory ends. See the Early History of Band Saws for the continuation of this story.